Due to geometric complexity and flexural mode conversion in pipe elbow regions, guided wave detection of a crack or a defect either in the elbow region or beyond it is usually difficult. The signals from the defects are either low in energy or immersed into the weld echoes in the elbow region. A new flexural mode tuning technique is introduced in this paper to find defects in the elbow region by amplifying the crack signal and subsequent signal to noise ratio. Flexural mode tuning can be accomplished by a staggered-spacing of angle beam transducers around the pipe or by circumferential time delay profiles applied to the multi-element angle beam transducers or segmented comb elements mounted in the plane around the circumference of the pipe. Experimental results indicate the potential of this method for finding the defects both at the outside region and the inner region of the elbow. Much work is being carried out today in pipe inspection with guided waves. See for example [1-5]. Special focus has been on pipe inspection under insulation or in hidden areas. Significant progress has been made on defect detection via phase velocity-frequency tuning . However, using this method alone may not be efficient for some defects located in complex shaped structures, e.g., pipe elbow. In this paper another tuning technique is presented--flexural mode tuning. It is used to find defects that are often blind to ordinary longitudinal axisymmetric wave propagation into an elbow region of a pipe. Flexural mode propagation occurs when partial loading is used on a pipe along its circumference, opposed to 360 degree loading which produces an axisymmetric mode . Besides partial loading, any non-uniform or out of phase loading can also be used to generate flexural modes. Hundreds of time delay profiles around the some number of transducer elements placed on the circumference can be used to produce different flexural modes, each having different propagation characteristics. Mode conversion occurs at the elbow region making detection difficult. On the other hand, by controlling interference phenomena, that of impinging with flexural modes rather than axisymmetric modes, it becomes possible to maximize the energy that might hit a particular defect, hence making defect detection possible. Experiments are presented here to show that this technique is useful for solving pipe inspection problems either in an elbow region or beyond, despite being hidden by structural or insulation considerations. The experiment was carried out on two carbon steel pipes with an elbow on each. A specially constructed eight channel Matec Instrument, including a tone burst wave generator, oscilloscope, and time delay adjustment capability was used to pulse eight angle beam transducers and to receive the echo signals. The angle beam transducers were loaded circumferentially on the outside of the pipe and 5 feet away from the elbow. Two transverse saw-cut cracks were made at the middle of each elbow, one at the outside region 0.8 inch in length and 20% through wall and the other is at the inner region 1.5 inches in length and 30% through wall. Dimensions of the pipe and experimental configuration are shown in Figure 1. Fig 1: Elbow test sample configuration and definitions. The 3.5-inch outer diameter (schedule 40) pipe is made of carbon steel. Figure 2 shows the experimental setup. Eight KB 0.5MHz broadband composite piezoelectric transducers were amounted on the 70-degree Plexiglas wedges. And the wedges were fastened axisymmetrically around the end of the pipe. In the experiment, the frequency was swept from 400KHz to 750 KHz, which corresponded to L(0,1) and F(1,1), F(2,1), F(3,1) etc. These modes at this frequency range proved to be sensitive to surface crack. 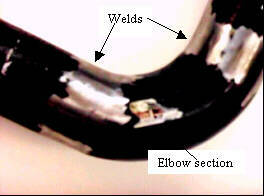 Figure 3 shows the two welds that join the pipe and elbow. Fig 2: Eight angle beam transducers and the eight channel Matec Instrument Fig 3: The pipe elbow region. In order to see the effects of the time delay applied to each transducer element, a flexural mode tuning technique for defect detection in the elbow region was developed. Experiments with one angle beam transducer and also with axisymmetric loading of all eight individual transducers around the circumference were studied for comparison purposes. 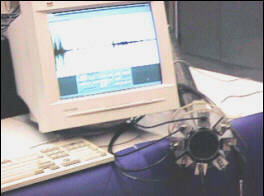 The guided wave pulse echo method was used for detection. For the crack on the inside region of the elbow, Figure 4 shows the waveform using just one angle beam transducer placed at the 0-degree position on the end of the pipe. The echo signals from the welds are easily seen, but that from the crack is not so clear. Figure 5 shows the axisymmetric loading without a time delay profile; the signal is almost the same as that of a single transducer. Frequency tuning does not improve the result. With the time delay flexural mode tuning technique, however, the signal from the crack is clearly seen in Figure 6. In this case, the defect echo amplitude is even larger than that of the weld echo. The time delay profile for the inner region defect is shown in Figure 7. Note that element 1 is positioned at 0-degree and element 5 is at 180 degree. For axisymmetric excitation, all of the eight elements are delayed at the same time (1.85ms here), while for flexural mode tuning, certain time delay profiles are applied. Many of the other profiles for crack detection could also be used. The tuning process would then capture the defect signal within the proper gate section between the two welds. Fig 4: Pulse echo waveform of one angle beam transducer placed on the pipe end at 0 degree shows the poor result for crack detection on the inner region of the elbow. Fig 5: Summed pulse echo waveform of eight axisymmetric loading elements without any time delay profile, again showing the poor crack detection result. Fig 6: Time delay profile applied to the eight-element angle beam transducers. The summed pulse echo signal shows an excellent result for the defect at the inner elbow region Fig 7: Time delay profile for both the axisymmetric loading and those used to detect the crack at the inner region of the elbow. For the crack on the outer region of the elbow, a similar comparison was made.. An excellent result is obtained here. See Figure 8. Note that a proper gate setting between the two welds allows us to tune and find the defects quite easily. The comparison among these three detection methods shows that the time-delay tuning technique is the most powerful for finding the crack in the elbow region. Fig 8: Pulse echo waveform of eight transducers with a proper time delay profile. The signal from the crack was very clear. Guided wave tuning is often essential for defect detection success. Earlier work reports the benefits of phase velocity-frequency tuning. When using non-axisymmetric waves, distance from the defect tuning is often required to obtain strong signals. We now add to the tool arsenal, time delay or flexural mode tuning. This 4-dimemsional tuning process of phase velocity via angle or comb spacing, frequency, distance, and now time delay or flexural mode tuning aids in both defect detection and location analysis and will certainly be useful in further studies on classification and sizing analysis. Sophisticated software will enable the tuning process to take place quickly and reliably with a transducer assembly at just one location. Multiple solution sets of phase velocity, frequency, axial distance, and time delay will usually be possible. Any one solution set for detection would be sufficient. Further work on defect classification and sizing will undoubtedly make use of the multiple solution sets and appropriate calibration standards or model analysis to establish a suitable defect reject criteria. Thanks are given to Krautkramer Branson for supplying superb 500 KHz piezocomposite transducers. Thanks are also given to the Office of Naval Research under contract N00014-96-C-0352 for their partial support of this work. J. L. Rose, Dale Jiao and Jack Spanner, Jr., "Ultrasonic Guided Wave NDE for Piping," Material Evaluation, Nov.1996 pp. 1310-1313. H. J. Shin and J. L. Rose, "Guided Wave Tuning Principles for Defect Detection in Tubing," J. Nondestructive Evaluation, Vol. 17, No.1, 1998, pp. 27-36. H. J. Shin and J. L. Rose, "Guided Wave by Axisymmetric and Non-axisymmetric Surface Loading on Hollow Cylinders," Ultrasonics, Vol. 37, 1999, pp. 355-363. D. N. Alleyne and P. Cawley, "Long Range Propagation of Lamb Wave in Chemical Plant Pipework," Material Evaluation, Vol. 45, No. 4, April 1997, pp. 504-508. M. J. Quarry and J. L. Rose, "Multimode Guided Wave Inspection of Piping Using Comb Transducers," Material evaluation, Oct. 1999, pp. 1089-1090. J. L. Rose, "Ultrasonic Waves in Solid Media," Cambridge University Press, 1999, pp154-176.